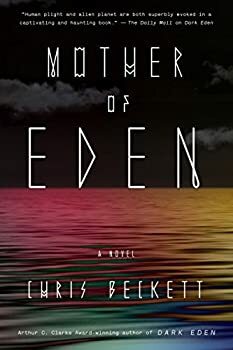 Mother of Eden, Chris Beckett’s sequel to Dark Eden, was thoughtful, complicated, and engrossing. Starlight Brooking lives with her people, the almost monastic Kneefolk, on Knee Tree Ground, a secluded island on Eden, a planet dominated by water. The Kneefolk make their living by trading bark boats with a few of the settlements nearby and staying out of the way of either Johnsfolk or Davidfolk, the two dominant, antagonistic human civilizations on Eden (the story of which schism is told in the first book). Kneefolk are peaceful, democratic, and content — all except for Starlight, who is unhappy with the secluded nature of her life. Like many young protagonists at the beginning of their story, she itches for something bigger, feeling as though she is destined for more important things than just endless harvesting of bark and daily meditation on the beach. The action of Mother of Eden kicks off when Starlight convinces some of the Kneefolk to join her on an exploratory trip to Veeklehouse, a major trading post a bit farther afield than Kneefolk usually go. She longs to see the Davidfolk settlement that has sprung up around Veekle (or “vehicle”), the crashed and broken spaceship that brought humans to Eden in the first place. It is a place of pilgrimage and veneration for all Eden’s human inhabitants, since they are each — Kneefolk, Johnsfolk, and Davidfolk alike — descendants of Tommy and Gela, the two stranded humans from Earth. When Starlight makes it to Veeklehouse, she is astounded by the buildings, the number of people, and most especially by Greenstone Johnson, a young man she meets from the far-away New Earth. He is handsome, sophisticated, and exotic; he convinces Starlight to join him in New Earth as his housewoman. The Johnfolk of New Earth have learned to mine and work metal and have technological capabilities that outstrip anything Starlight has heard of before. Having fallen in love with Greenstone, Starlight agrees, not knowing that she is about to be thrust into a hierarchal, patriarchal society that thrives on slavery, human sacrifice, and murderous politics. When she arrives, she is given the position of Mother of Eden, a puppet role in which she speaks for their ancestor, Mother Gela. Outraged with the policies she sees around her, she resolves to use her position to change things, to make them better for the “smallfolk,” the oppressed. In doing so, she endangers herself, her husband, her home on Knee Tree Ground, and indeed all of Eden as a war between the Davidfolk and the Johnfolk brews in the background. I enjoyed the grand scale of Mother of Eden. The two journeys (one of them alone) that Starlight makes across the World Pool are frightening and exhilarating; Beckett conveys the sense of the unknown that early explorers crossing the Atlantic or the Pacific must have felt, not knowing what was on the other side of a giant ocean. He also did a great job at giving us snapshots of the different cultures that have emerged on Eden from Tommy and Gela’s descendants. The trading post at Veeklehouse was a wonderful place to see various dialects, clothing, food, and even social institutions like marriage. All of these details make Eden, and the story Beckett is telling, feel epic. I found the plot of Mother of Eden much more interesting than Dark Eden. Here we see the political and social ramifications of the events of the first book. Beckett shows us what civilization looks like when people create it in isolation. In New Earth, Starlight encounters a class structure based on mutation and birth defects, the oppression of the working class, and a power structure that disempowers women. And she sees first-hand the way history changes, depending on what stories are allowed to be told and who is allowed to do the telling. In among all of this, Beckett weaves a theme of religion. Starlight’s position as the Mother of Eden is a blend of the Virgin Mary and a Christ figure. Near the end, her words and deeds become part of the ever-evolving mythology of Eden as miracles, healing, and a powerful message of equality are attributed to her. Mother of Eden is theme-driven, but it still contains good characterization. Starlight’s maturation is rewarding; her journey is slow and realistic, and we get lots of windows on her character through the multiple perspectives that Beckett uses to tell his story. Not all of the secondary characters are very well fleshed out, but Starlight starts out as an impulsive, attention- and adventure-hungry brat and ends up a powerful leader. And the way the book ends, I’m fairly sure there will be at least one more. I can’t wait to find out what happens to Starlight next. I listened to this as an audio book, produced by Random House Audio, and narrated by Jayne Entwistle, Bruce Mann, Heather Wilds, Suzan Crowley, Nicholas Guy Smith, Lucy Rayner, Hannah Curtis, Katharine McEwan, and Emma Bering. The cast did a great job with all of the various characters and only one thing kept throwing me off. In the book, the words “mother” and “sister” are used a lot, especially as the entire population of New Earth often chants the word “Mother” when they encounter Star in her Mother of Eden role. However, the cast members kept pronouncing these words “mothar” and “sistar.” I looked briefly at the Google books version of Mother of Eden to see if this is one of those dialect things Beckett did, perhaps spelling the words a little different to indicate language change, but it doesn’t seem like it. So… that was weird. I’d be really interested to hear if anyone else listening to the audio heard it the same way.